My inspiration for this painting began in 2008. I was in Kenya and Tanzania on Safari. This has always been a dream and when I returned home the dream became a studio reality. Since that time, I’ve been exploring the relationship between migrating wildlife and the landscape. One of the issues that quickly became apparent then and when I returned in 2014, is the persistence of drought. So, I’ve spent the last seven years exploring the presence and lack of water and the impact on migrating herds, especially zebra and wildebeest. Single Zebra is a celebration of this marvelous symbiotic relationship where the animals shape the landscape and are shaped by it. As with my other paintings, no exact place is described. Instead, I pull imagery from different sources (my photographs and imagination) to combine them in a way that suggests my experience. 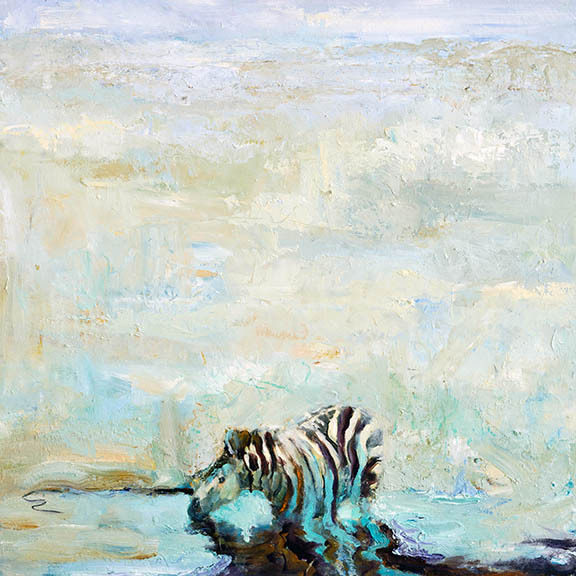 In this case, the sky, land and water become one, suggesting mist and coolness pressing down upon the zebra which in turn, acts as a visual and metaphorical anchor stabilizing the vast blue above it. The zebra melts into the coolness – there’s no separation between matter.